Once a solution has been developed, it is important to receive feedback from the user base, the client and any mentors in order to ensure that the final product is the best it can possibly be. It can be easy to get tunnel visioned over the course of a design project. Seeking feedback allows for a fresh set of eyes that can identify problems, suggest solutions and find areas for improvement. 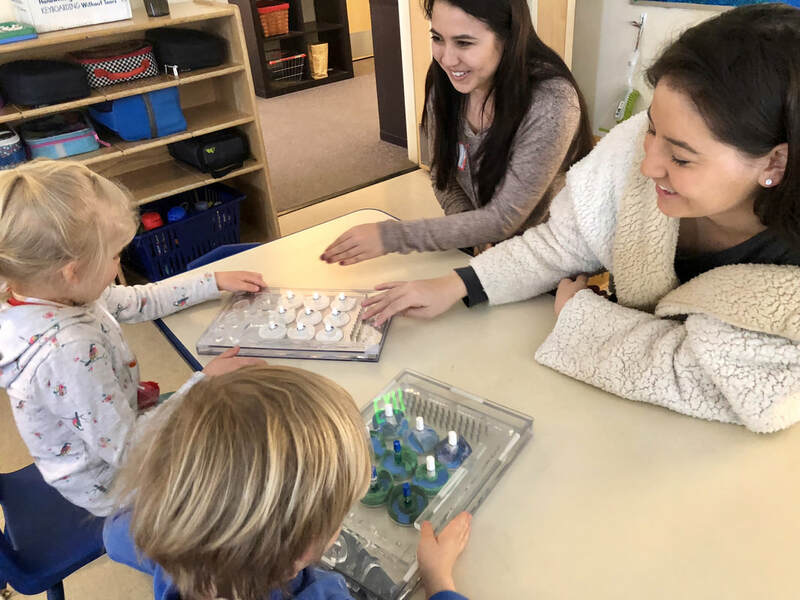 In order to receive feedback from the user base, the team conducted qualitative testing with children from local elementary schools. While these subjects did not fit exactly with the target user base of children in a hospital setting, they were able to provide information on the general interests of children in the target age group giving the team a gauge of how fun the toy would be. These tests consisted of allowing the subjects a chance to play with prototypes created by the team, asking a series of survey questions in small focus groups and recording the results along with any relevant comments made by the subjects. The team also included teachers in these tests along with the children as their experience with children in our age group could provide valuable insight into how interested children would be in the toy as well as how effective it is at teaching about the water cycle. As a result of these tests the team learned that the toy was fun to play with, however some of the imagery used in the design was a bit confusing, which made the teaching element less effective. In order to receive feedback from the client, each prototype was presented upon completion. The client was allowed to play with the toy and feedback was received informally based on the client’s comments and suggestions. From this the team was able to gain a better perspective on the client’s vision for the toy. The team learned that the amount color on the toy was lacking, the weight was a bit high, and again that some of the imagery was a bit confusing. Despite this the team also learned that the client was generally happy with the direction the product was moving. Mentor feedback was received from a variety of sources in the form of both informal and formal presentations of prototypes and CAD drawings. The mentor that the team worked most closely with was the team’s director. The director worked closely with the team at each stage in the design process providing feedback along the way in meetings as well as formal presentations. 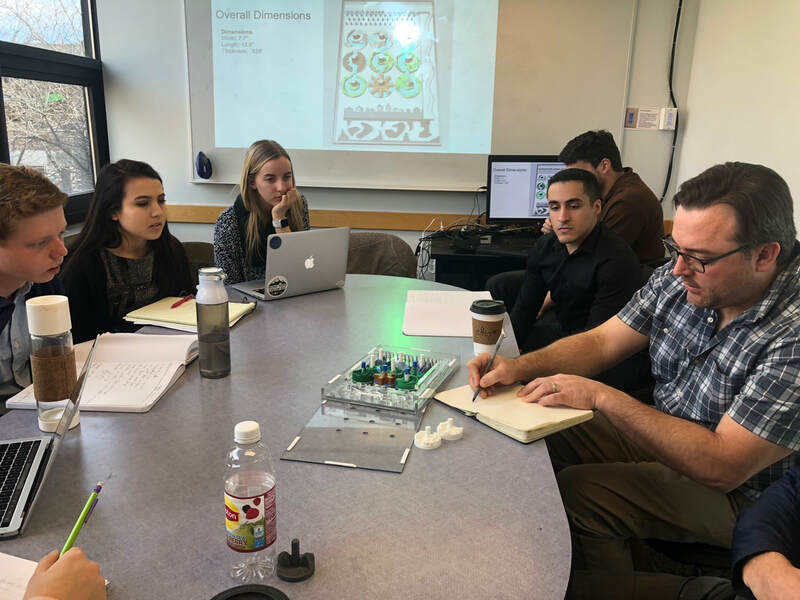 In addition to the director, the team was also able to get feedback from the professors of the course as well as the faculty of the University of Colorado’s Idea Forge. In order to receive this feedback, the team conducted a manufacturing review. A large presentation on the overall design of the product, focusing on how it will be manufactured. In this presentation, the team was able to receive advice on the most effective manufacturing methods, and learned that the design could be feasibly manufactured. Along the course of this project the team decided to outsource manufacturing to Kodo Kids, a local toy company. While they were not meant to act in the capacity of a mentor, due to their experience in this area, working alongside them gave a lot of insight in to how the product could be designed to optimize mass manufacturing, as well as how to improve its overall aesthetics. From this feedback, the team learned that manufacturing the bulk of the toy out of one piece of material would be much more feasible than putting a number of pieces together. The team also learned that mixing abstract and realistic imagery was most likely the source of the confusion experienced by both the client and the user testing subjects. 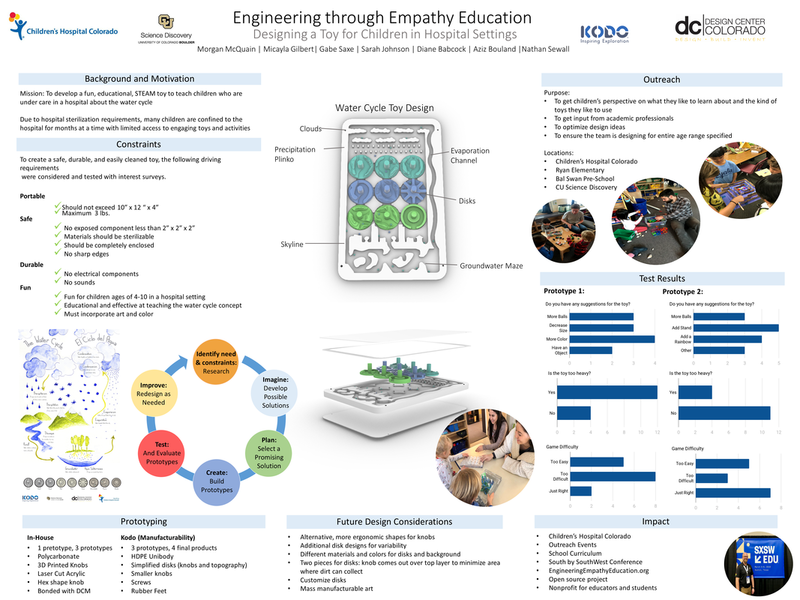 At the end of the year the product was presented at the University of Colorado's Design Expo. The team was judged on the presentation and the product itself and got to present it to the public. The team received a lot of positive feedback from the judges and attendees of the expo, and got an opportunity to see children and adults having fun playing with the toy. Below is the poster that was presented at the expo. In addition to the expo the team also had the opportunity to present the story of the project to the client and stakeholders including representatives from CU Science Discovery, the Boulder Valley School District and Kodo Kids. Below is the slideshow for this presentation.